This is the 2" equivalent of Celestron's previously reviewed 1.25" Eyepiece and filter kit. The price, at $299.95 (2012 MSRP), is considerably higher and fewer eyepieces are included, but the "starter set" intent is the same. Basically, this is a cased set of inexpensive 2" eyepieces to get the buyer started. Unlike Celestron's 1.25" kit, which favors high magnification eyepieces, the 2" kit sensibly favors longer focal length eyepieces. The Celestron 2" Eyepiece and Filter Kit (#94305) contains three E-Lux eyepieces of 40mm, 32mm and 26mm focal lengths, plus a 2x Barlow lens. The 26mm and 32mm oculars have an apparent field of view (AFOV) of 56-degrees, while the 40mm has an AFOV of 50-degrees. These are not impressive AFOV's, as many 2" 40mm oculars boast an AFOV of around 60-degrees. This means that you will get less of the wide field of view for which you probably bought 2" eyepieces in the first place. Another drawback is that these are three element, Kellner design eyepieces, rather than the more advanced optical designs used in more expensive 2" oculars. Some recent Celestron advertising calls these "Plossl" oculars, which they clearly are not. A Plossl is, by definition, a four element symmetrical design. Previous Celestron data stated that these were Kellner eyepieces. The Kellner is an acceptable economy eyepiece design, but it is not as well corrected as Ortho, Plossl, Erfle and other optical designs with more elements. These Celestron 2" eyepieces are fully multi-coated and they are well made with a gloss black finish, no doubt produced by Celestron's new corporate owner, Synta Optical of Red China. Their mounting barrels are hard chromed and threaded to accept 2" filters. Being large diameter eyepieces, they are easy to view through. The eye relief is 20mm. Because the AFOV is not vignetted by a 1.25" diameter mounting barrel, the 2" 40mm E-Lux provides a considerably wider true field of view than Celestron's higher grade Omni Plossl eyepiece, which has a 43-degree AFOV limited by its 1.25" mounting barrel. To compare the true field of view of these 2" E-Lux oculars to 1.25" Plossl oculars, we used our Celestron Omni XLT102ED telescope, which has a 900mm prime focal length. In this scope, the 2" E-Lux 40mm provides a true FOV of 2.22 degrees, compared to only 1.91-degrees for a 1.25" Omni 40mm Plossl. In fact, the 2" E-Lux 32mm eyepiece provides a true FOV of 2.0-degrees, still slightly greater than the 1.25" Omni 40mm. The 2" E-Lux 26mm eyepiece provides a true FOV of 1.6-degrees, which is wider than the 1.39-degree FOV of a typical 25mm 1.25" Plossl. The bottom line is that your true field of view does benefit from using these 2" E-Lux oculars (compared to 1.25" Plossls), just not as much as it would if you purchased more sophisticated 2" eyepieces, such as Celestron's Ultima LX line. The 2x Barlow lens supplied in the Kit is a simple, two element, achromatic design that will create color fringing, even in an apochromatic telescope. We are not fans of 2x Barlow lenses at best, since they reduce the light that reaches your eye to only 25% of what you started with, and certainly not of inexpensive two element Barlows guaranteed to degrade the overall image quality. The Kit also includes a 2", multi-coated, mirror star diagonal. This comes with a threaded adaptor to attach to the rear cell of Celestron Schmidt-Cassegrain telescopes and a standard 2" mounting tube that allows use with refractors having 2" focusers. It will mount on C5 and C6 telescopes, but it doesn't make sense to use such a large and heavy star diagonal and big 2" oculars on these compact, lightweight telescopes. The 2" diagonal works fine on C8 and larger SCT's, as well as 4" and larger refractors. It worked well on our Omni XLT 102ED refractor, which comes with a 2" Crayford focuser. The Kit's filters include Wratten numbers 25 (red), 58 (green), 12 (yellow), 21 (orange) and 80A (blue). The latter is a film conversion filter, intended to allow the use of tungsten film (3200-degrees K) in daylight (5500-degrees K). We would guess that not many amateur astronomers are going to get much use out of this filter. Conspicuously absent from the filter set is a moon filter, the one filter most amateur astronomers do find useful. A moon filter should definitely be included, preferably instead of the 80A. In the absence of a proper (neutral density) moon filter we decided that, among the supplied filters, the #58 green filter was the best substitute for lunar observing. 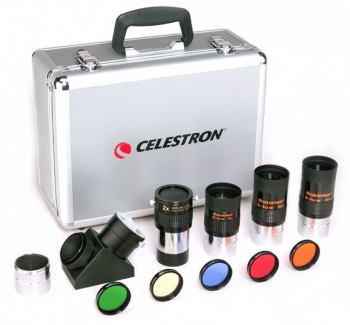 We suggest that if Celestron were to offer a "Deluxe 2 in. Eyepiece Kit" it would be more useful than the present kit. Such a Deluxe Kit should include a case, star diagonal, moon filter and 32mm, 22mm and 17mm Ultima LX 2" eyepieces. All Ultima LX eyepieces have a 70-degree AFOV and 16mm eye relief. (See our review of Celestron Ultima LX eyepieces for more information.) Such a kit would include only genuinely useful accessories and nothing that the buyer would outgrow as his or her experience increases. Of course, it would be more expensive. You generally get what you pay for. Anyone stepping up to 2" oculars for the first time will be impressed by the Celestron 2" Eyepiece and Filter Kit. On telescopes large enough to take advantage of them, it is hard to deny the appeal of 2" oculars. Copyright 2012, 2016 by chuckhawks,com. All rights reserved.